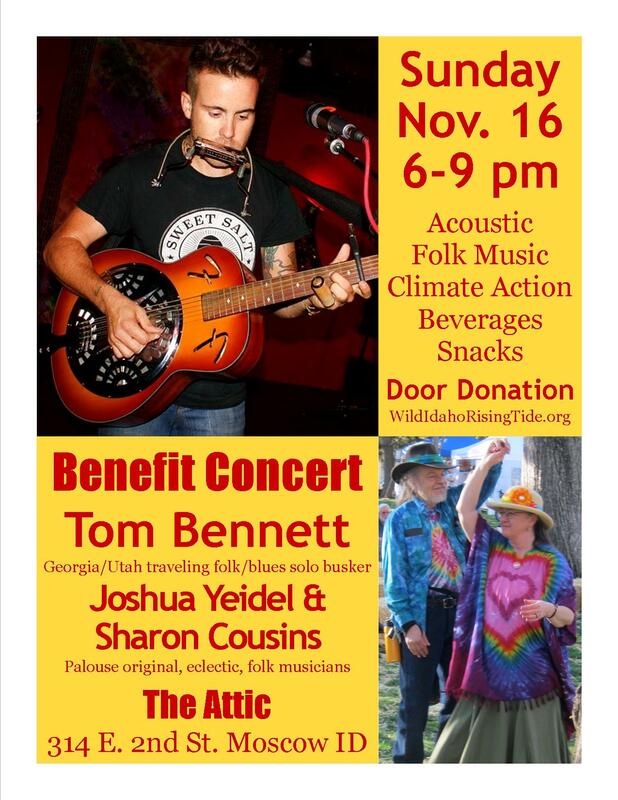 Wild Idaho Rising Tide (WIRT) is hosting a special fall benefit concert to open the year-end giving season and raise funds for strategic relocation and expansion of our anti-fossil fuels infrastructure, direct action campaign and operations in southwest Idaho. Please join community supporters and WIRT activists at The Attic, up the back stairs of 314 East Second Street in Moscow, Idaho, from 6 to 9 pm on Sunday, November 16, for a social hour with refreshments and discussion of ongoing WIRT climate justice campaigns and an evening of rousing, acoustic, live folk and blues music at this intimate downtown venue. At 7 pm, local husband-and-wife composers and musicians Joshua Yeidel and Sharon Cousins will open performances with their original, eclectic, multi-generational songs and lyrical messages of love and life, history and hope. After performing as solo street musicians in San Francisco, Sharon and Josh have been filling the Palouse community with tunes since their migration to the region in 1976, lately hailing from a ridge above Viola. They have formed and collaborated with several, local, folk/rock bands over the years, including Sun-on-the-Mountain, Jasper, We Here Now, and Sagin’ Time, performing primarily at Inland Northwest festivals, concerts, and private parties, and producing and releasing the albums Sign to the Blind, Early Morning Rising Glow, and The Taste of Life Itself . Through a revitalizing mixture of uniquely upbeat, inclusive, alternative music, these fellow WIRT members have been singing since they could talk and playing their primary, respective instruments, the guitar and flute, for more than 50 years. Together, they offer concert listeners over a century of experience in the enlightening joy of rich, diverse music. Tom Bennett of Salt Lake City will take the stage next. A native of Villa Rica in the rural, north Georgia countryside, Tom is a true, relentless, traveling, folk/blues singer and activist [2, 3]. At age nine, he began playing the harmonica given to him by an old woman from West Virginia. He has journeyed in nearly every U.S. state on buses, freight trains, and by hitchhiking, and has stayed with East Los Angeles gang members and at isolated, polygamist enclaves. Always seeking adventures, Tom shares his stories while performing on resonator guitar, harmonica, tambourine, suitcase percussion, and vocals, which he often plays together in the style of a one-man-band busker, as demonstrated in his recent video rendition of Sharecropper’s Blues . Along with founding a regular, folk-music showcase and a folk-centric record label, Sweet Salt Records, and releasing a debut album, The Man Who Shook the Trail of the Devil’s Hounds, this talented and inspiring musician likes doing shows that spread awareness of various issues . 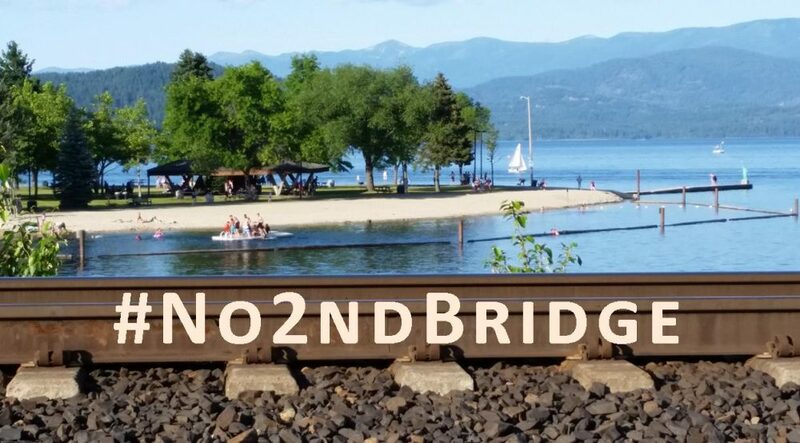 He has performed at the Utah March against Monsanto and the Clean Air No Excuses rally at the Utah Capitol, and at other human rights and environmental events besides a recent, 20-plus-state, summer tour through the West Coast and Deep South. For admission by free-will donation, WIRT welcomes everyone to come and hear Josh’s, Sharon’s, and Tom’s rowdy tales and gritty, soulful songs of authentic, Americana folk life and music, and to enjoy the opportunity for a rare WIRT convergence, before the dual college towns of Moscow and Pullman disperse for Thanksgiving-time vacations. Please bring your resistance spirit and friends and your contributions of funds and additional beverages and/or snacks on Sunday evening, November 16, at 6 pm. We hope to give some of the proceeds to these valiant, volunteer, visiting musical guests, who consider it “a great privilege and honor to do this show” for Wild Idaho Rising Tide. Peruse the WIRT facebook and website pages for further information about this event and our campaigns, share this announcement, and print and widely post the color, letter-sized Acoustic Folk Benefit Concert Flyer. Thanks!